What nail polish to wear for the holidays? The choices are endless, but if you’re feeling festive, red and gold are always a great way to go. If you’re feeling bolder, you can up the ante by going brighter and sparklier. 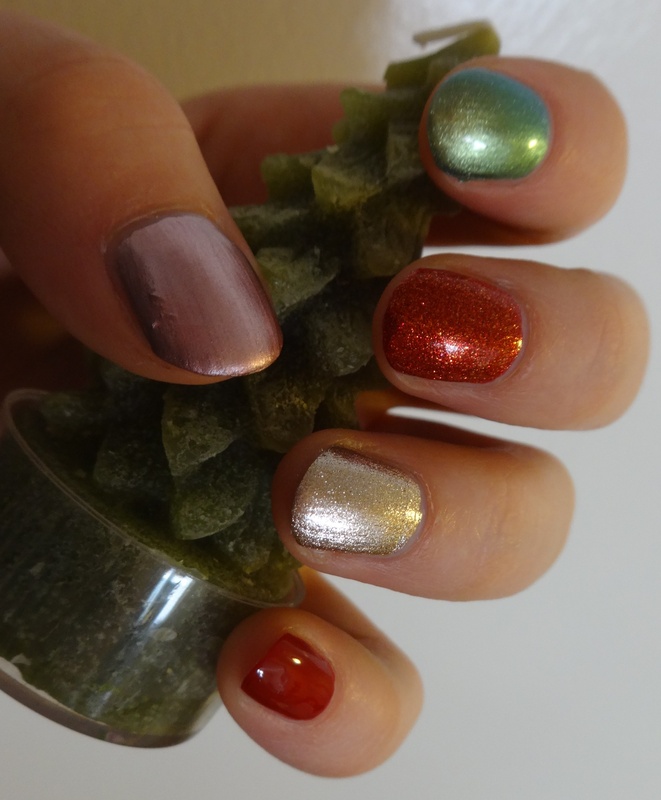 Since quiet is not really in my nail polish vocabulary, I decided to break this post up into “subtle” (inasmuch as that is possible) and “wild” shades as suggestions. You’ll notice that the “subtle” category still isn’t muted: it’s the holidays! Why not be just a bit more shiny than usual? Also, for me, December involves a lot of staying inside (hiding from the cold temperatures, but also…writing), so at least least I’ve got something bright on my nails to foster good cheer. On top: Maybelline “Mystic Green”. It’s about as subtle as green gets. Although the bottle claims that this polish is holographic, It’s more of a strongly shimmering green, with maybe a hint of gold. Three fairly thick coats here. 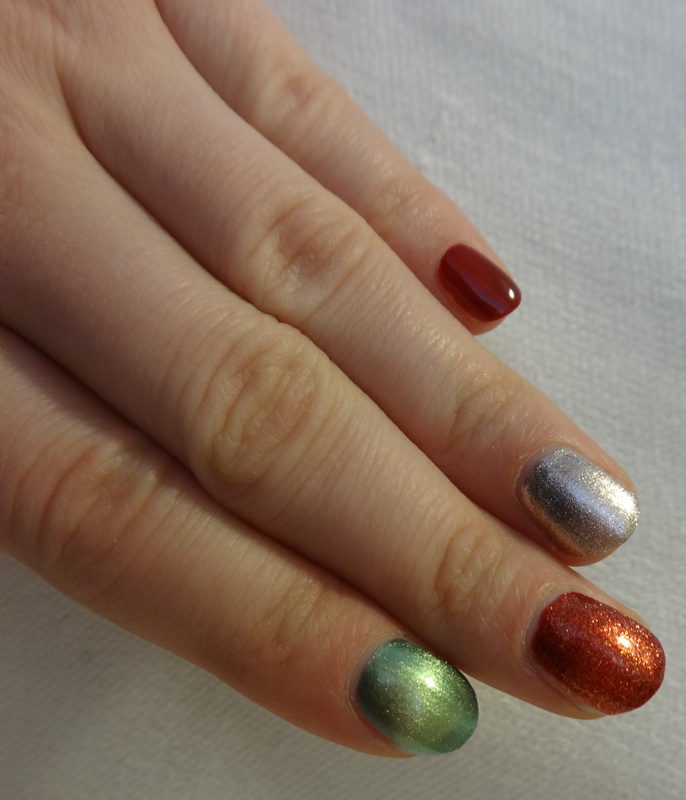 Second down: Julep “Karmen”. A great red with small gold flecks. In most lights, you get the full effect of the gold. Even in the shade, it is a nice, shiny brick red. Two coats here. 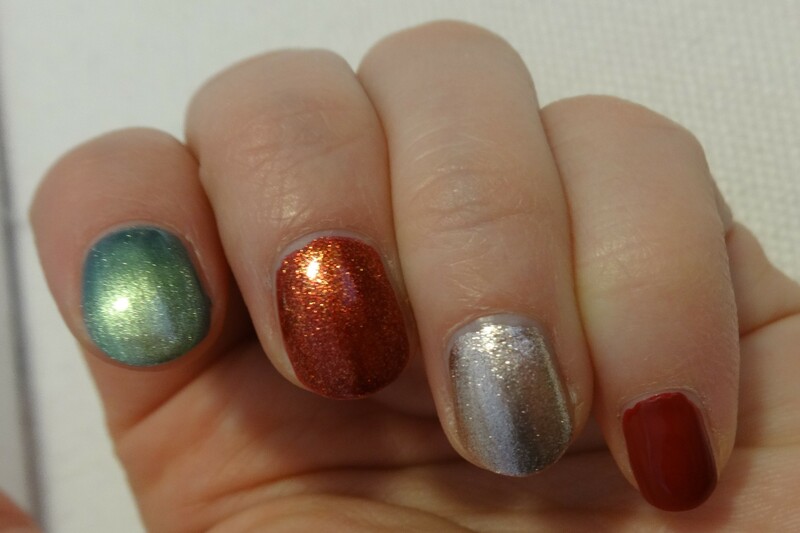 Third down: Julep “Zelda”. Shiny foily finish that’s really forgiving to work with. The color is like silver with a rose gold infusion. While the color might be close to a neutral, the finish takes it that extra step to being holiday-party worthy. Amazing one-coater opacity. Bottom: Essie “A-list”. Everybody needs a nice go-to red for the holidays. This is my go-to red for whenever. A nice need red creme with a hint of crelly, so it has nice depth. Two coats here. No top coat used. Indirect sunlight in all photos. 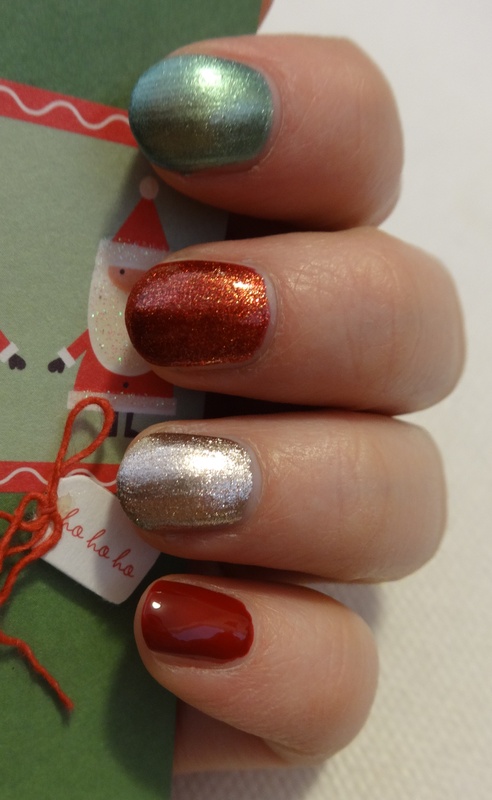 Bonus color on the thumb: Julep “Maria”. A frosty silver-pink. Pretty color, but a complete pain to work with. Thoughts? What are you wearing for the holidays? Think I need to learn the meaning of “subtle” a bit better?